The Vox Maris is the loudest pipe organ as certified by the Guinness of World Records and it was heard across Yeosu in South Korea as it prepared to welcome visitors at the World Expo in the city. A few weeks before the official opening, the Expo village is almost ready. In line with the theme, “The Living Oceans and Coasts”, organisers have done their best to minimise the environmental impact of this event. An old cement silo has been turned into a seawater desalinisation system. At full capacity, it supplies 12 tons of drinkable water per day, sufficient for about 6000 people. “The purpose of this Expo is to provide a solution to present problems by using the technology of the future. As you know, water shortage is a very serious problem. By presenting a system like this, we want to send a message to the world: we can find solutions to our problems in the oceans,” explained Yang Honjju who is the Head of the Sky Tower project team. “When we’ll be able to extract hydrogen directly from the water, then every family will have the ability to use this electricity for their cars and their other needs. Only then, in 15 or 20 years, a system like this one will be economically viable,”.pointed out Mo Goang-Jong, Chief Engineer at the Korean Pavilion. Metal coils inserted on the road deliver electric power to other coils placed under the vehicle. This way, batteries are charged automatically without wires, every time the bus stops on one of these segments and even as it drives along. Park Jong-Han the General Manager OLEV company explains, When the bus is on a segment it means the power is moving from the segment to the pick-up, and from the pick-up to the batteries. So the batteries charge will increase”. No need to spend hours re-charging and no need for extra batteries. The World Expo aims to project the city into a greener future, more in tune with the marine environment. 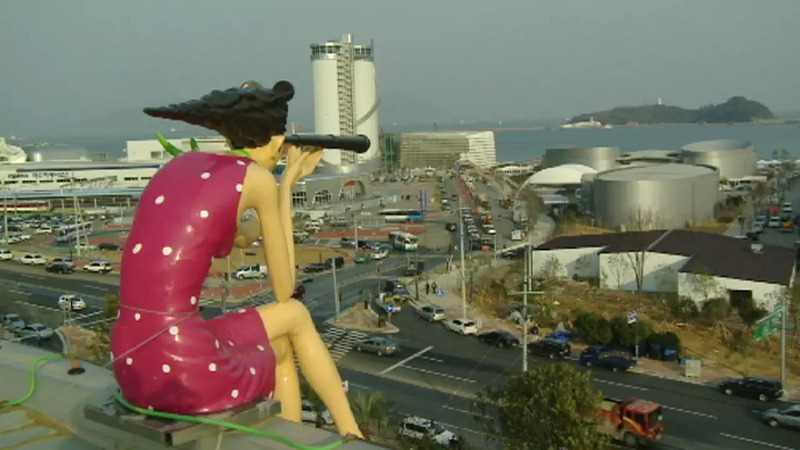 But today, Yeosu still bears the marks of a hefty industrial development. The city hosts one of two major petrochemical complexes in South Korea, with more than 30.000 employees. 35% of the oil consumed nationwide is refined here. “It’s true that the industrial complex is essential to the local economy, but it’s also true that it had a negative impact on the environment,” says Noh Jin Gwan, Head of planning for Expo 2012 Yeosu. The World Expo is a chance for organisers to promote the natural heritage of this region, in order to attract tourists. Cho Yong-Hwan, Chief of Public Relations for Expo 2012 expressed his hopes. “When it comes to tourism, people in South Korea believe that the region around the capital is the place where you can find the best. But after the Expo, I’m sure that also the southern coast, with the city of Yeosu at the centre of it, will become a real alternative”. Much has been done to improve the quality of the coastal waters, by dredging and cleaning the harbour. The organisers now guarantee that the water is much cleaner than before. But environmentalists say there was room for improvement. Activists complain that only a little more that 4% of the energy supplied to the Expo village is renewable. But Yeosu residents prefer to think of this Expo as a chance for a new and cleaner development, one that will change their city for the best. “What am I expecting? There will be many tourists after the Expo. Business owners will gain more money,” said one man while another woman added, “The fact that the city of Yeosu is holding the Expo is very meaningful because there are many port cities in Korea, but this is the only one which has been designated for this. After this decision, I’ve seen many improvements in this city”. Another man summed it up like this, “The local environment will benefit from the Expo and the mindset of the people here will change”.